Anggoman, Yuliana (2001) Dinamika psikologis isteri yang mengalami kekerasan fisik di dalam rumah tangga. Skripsi thesis, Universitas Tarumanagara. Women are fragile to violence out of their houses orto domestic violence. A wife who experienced physical violence in her marital life will suffer psychological impact in her life. 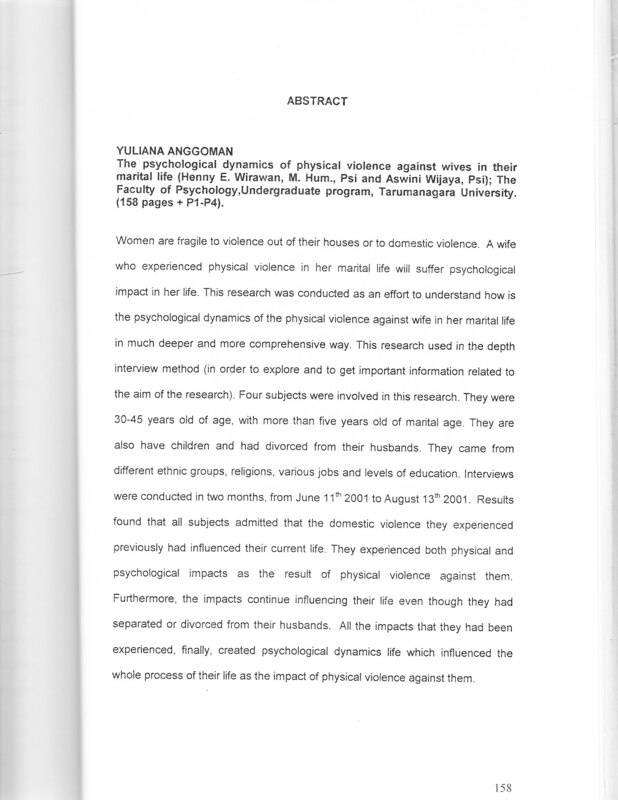 This research was conducted as an effort to understand how is the psychological dynamics of the physical violence against wife in her marital life in much deeper and more comprehensive way. This research used in the depth interview method (in order to explore and to get important information related to the aim of the research). Four subjects were involved in this research. They were 30-45 years old of age, with more than five years old of marital age. They are also have children and had divorced from their husbands. They came from different ethnic groups, religions, various jobs and levels of education. Interviews were conducted in two months, from June 11th 2001 to August 13th 2001. Results found that all subjects admitted that the domestic violence they experienced previously had influenced their current life. They experienced both physical and psychological impacts as the result of physical violence against them. Furthermore, the impacts continue influencing their life even though they had separated or divorced from their husbands. All the impacts that they had been experienced, finally, created psychological dynamics life which influenced the whole process of their life as the impact of physical violence against them.